For the city in Greece, see Ellinikon. Gnanico, Agliatica, Ellenico, Ellanico, Uva Nera and "Southern Barolo"
Aglianico (English: /ælˈjænɪkoʊ/ al-YAN-i-koh; Italian: [aʎˈʎaːniko]) is a black grape grown in the southern regions of Italy, mostly Basilicata and Campania. The vine originated in Greece and was brought to the south of Italy by Greek settlers. The name may be a corruption of vitis hellenica, Latin for "Greek vine." Another etymology posits a corruption of Apulianicum, the Latin name for the whole of southern Italy in the time of ancient Rome. During this period, it was the principal grape of the famous Falernian wine, which is said to be white wine, the Roman equivalent of a first-growth wine today. Oenologist Denis Dubourdieu has said "Aglianico is probably the grape with the longest consumer history of all." Aglianico is also nicknamed "the Southern Barolo" (Barolo del Sud) because the grape can have striking similarities in frame and taste refinement to the Nebbiolo grape of Piemonte, notably in Barolo. Ruins from the Greek settlement of Cumae. The vine is believed to have first been cultivated in Greece by the Phoceans from an ancestral vine that ampelographers have not yet identified. From Greece it was brought into Italy by settlers at Cumae, near modern-day Pozzuoli, and from there spread to various points in the regions of Campania and Basilicata. While still grown in Italy, the original Greek plantings seem to have disappeared. 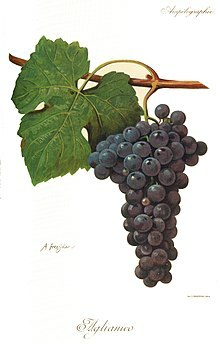 In ancient Rome, the grape was the principal component of the world's earliest first-growth wine, Falernian. Along with a white grape known as Greco (today grown as Greco di Tufo), the grape was commented on by Pliny the Elder, the maker of some of the highest-ranked wines in Roman times. Traces of the vine have been found in Molise, Apulia, and also on the island of Procida near Naples, although it is no longer widely cultivated in those places. The grape was called Ellenico (the Italian word for "Greek") until the 15th century, when it acquired its current name of Aglianico. Despite the similarities in naming, the Campanian wine grape Aglianicone is not a clonal mutation of Aglianico but DNA analysis does suggest a close genetic relationship between the two varieties. In Basilicata, Aglianico forms the basis for the region's only DOCG wine, Aglianico del Vulture, and is concentrated in the northern area of the province of Potenza. The most sought-after productions of Aglianico del Vulture come from the vineyards located in and around the extinct volcano Mount Vulture. The grape has also recently been planted in Australia, Texas and California, as it thrives in predominantly sunny climates. In Australia it is being introduced in the Murray Darling region with some success. Producers in McLaren Vale, Margaret River, Mudgee and Riverland are also experimenting with plantings. Vieni Estates in the 20 Valleys area of Ontario, Canada has also been growing Aglianico vines since 2001 and producing Aglianico Wine since 2010. It also shows some promise in the area near Willcox, Arizona. The Aglianico vine buds early and grows best in dry climates with generous amounts of sunshine. It has good resistance to outbreaks of oidium, but can be very susceptible to Peronospora. It also has low resistance to botrytis, but since it is much too tannic to make a worthwhile dessert wine, the presence of this noble rot in the vineyard is more of a viticultural hazard than an advantage. The grape has a tendency to ripen late, with harvests as late as November in some parts of southern Italy. If the grape is picked too early, or with excessive yields, the grape can be aggressively tannic. The vine seems to thrive in particularly volcanic soils. Wines produced from Aglianico tend to be full-bodied with firm tannins and high acidity, endowing them with good aging potential. The rich flavors of the wine make it appropriate for pairing with rich meats such as lamb. In Campania, the grape is sometimes blended with Cabernet Sauvignon and Merlot in the production of some Indicazione Geografica Tipica (IGT) wines. In its youth, Aglianico is very tannic and concentrated, requiring a few years of ageing before it can be approachable. As it ages, the fruit becomes more pronounced and the tannins more balanced with the rest of the wine. The trademark coloring of the wine is a deep garnet. In well made examples of the wine, it can have chocolate and plum aromas. Aglianico is also known under the synonyms Aglianica, Aglianichella, Aglianichello, Aglianico Amaro, Aglianico del Vulture, Aglianico di Castellaneta, Aglianco di Puglia, Aglianico di Taurasi, Aglianico Femminile, Aglianico Mascolino, Aglianico nero, Aglianico Tringarulo, Aglianico Zerpoluso, Aglianico Zerpuloso, Aglianicone, Aglianicuccia, Agliano, Agliatica, Agliatico, Agnanico, Agnanico di Castellaneta, Cascavoglia, Cerasole, Ellanico, Ellenico, Fiano rosso, Fresella, Gagliano, Ghiandara, Ghianna, Ghiannara, Glianica, Gnanica, Gnanico, Granica, Olivella di S. Cosmo, Prie blanc, Ruopolo, Spriema, Tringarulo, Uva Catellaneta, Uva dei Cani, Uva di Castellaneta, and Uva near. ^ "Aglianico". Oxford Dictionaries. Oxford University Press. Retrieved 2018-08-18. ^ H. Johnson Vintage: The Story of Wine, p. 73 Simon and Schuster 1989 ISBN 0-671-68702-6. ^ "Vieni Estates - Wines - Red - Aglianico". www.vieni.ca. Retrieved 2016-01-21. This page was last edited on 21 April 2019, at 01:58 (UTC).